Veteran’s Day 2013 – Nerdwatch! At the 11th hour, on the 11th day of the 11th month of 1918, the guns of war fell silent for a time. 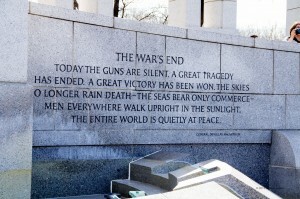 The men and women who fought in that “War to End All Wars” hoped and prayed that no one would ever hear the guns of war again. And again, and again, and yet again, these prayers were not answered, and new generations of men and women gave up safety and peace, gave their blood and sweat and life and limb, so that we could live our lives safe and at peace. All those who fought in that terrible first World War have now passed, and we are saying farewell to the men and women of the “Greatest Generation” that followed, far too soon. We have lost so many others to other wars since, but yet there remain those who feel the call to defend and protect what peace we have, who do not feel the sacrifice to be in vain. Tagged Armistice Day, Rememberance Day, Veteran's Day. Bookmark the permalink.